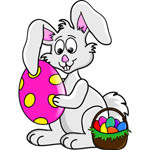 Join the Easter bunny for seasonal crafts, games and a mini egg hunt! Children must be accompanied by an adult. Cost: $10.00 per child. Mossop the Bunny is coming to Brentwood for a fun Easter show followed by Easter craft time! The Easter Bunny is stashing treats at the pool. Seven-year-olds and younger must be accompanied by an adult in the water. Bring your bathing suit. Loonie swim rates apply. Come join in on the Easter festivities. Decorate an Easter basket that you can use to collect eggs during our mini egg hunt! Children must be accompanied by a grandparent. Cost: $6.77 per child. No drop-ins. This family event is filled with activities for children between three and 10 years of age. Event highlights include: entertainment featured at the Bandshell, crafts & face painting, photos with Mr. & Mrs. Bunny, the petting farm and loads of fun activities for youngsters to enjoy. Concession services will be available. Admission is free.